There are two ways for creating and managing repositories, either through the Workbench interface, or by using the RDF4J console. 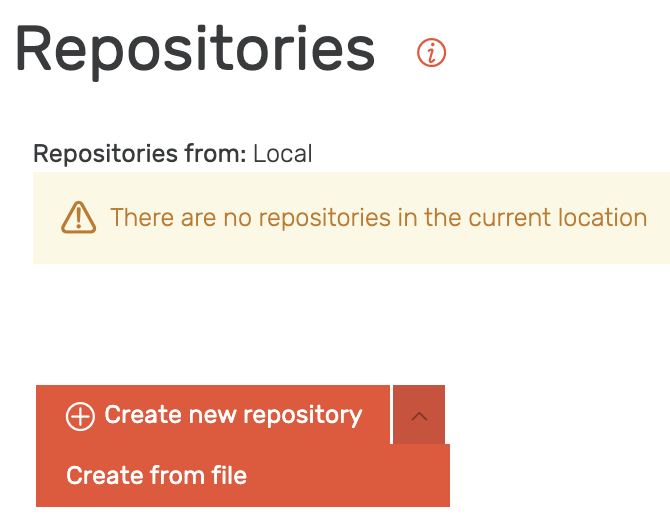 To manage your repositories, go to Setup -> Repositories. This opens a list of available repositories and their locations. Click the the Connect button next to the location you want to activate. Click the Create new repository button or create it from a file by using the configuration template that can be found at configs/templates/. Enter the Repository ID (e.g., repository1) and leave all other optional configuration settings with their default values. For repositories with more than few tens of millions of statements, see the configuration parameters. Click the Create button. You newly created repository appears in the repositories list. Use the create command to add new repositories to the location that the console is connected to. This command expects the name of the template that describes the repository’s configuration. Fill in the values of the parameters in the console. Connect the newly created repository to the active location. Alternatively, use the dropdown menu in the top right corner. This allows you to easily change the repository while running queries as well as importing and exporting data in other views. Use the pin to select it as a default repository. 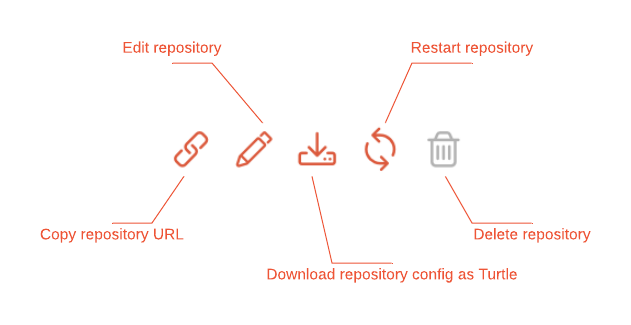 To edit or download the repository configuration as a turtle file, copy its URL, or delete it, use the icons next to its name. Once a repository is deleted, all data contained in it is irrevocably lost.